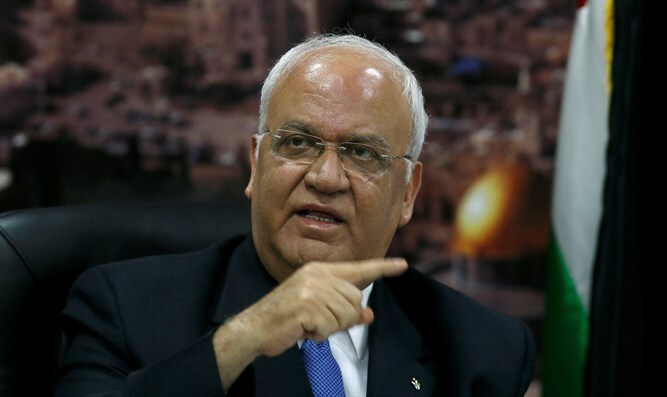 Saeb Erekat challenges Israeli PM to meet PA chairman anywhere in the world. The chief Palestinian Authority (PA) negotiator Saeb Erekat claimed that PA chairman Mahmoud Abbas is willing to meet Prime Minister Binyamin Netanyahu “anywhere in the world”. “I challenge Mr. Netanyahu [to meet Abbas], officially. He can choose any country, any country on earth. Moscow, Beijing, London, Berlin,” said Erekat, secretary-general of the Palestine Liberation Organization’s (PLO) Executive Committee, in an interview with German broadcaster Deutsche Welle. “He will meet him. This is a challenge, a declared challenge,” he added. Since that time, Abbas has continuously chosen to impose preconditions on talks with Israel rather than heeding Netanyahu's call to sit down and negotiate. Erekat’s comments come as the Trump administration continues to prepare its plan for peace between Israel and the PA. Abbas, however, has rejected the plan before it has even been unveiled. The PA chairman has been boycotting the US ever since Trump’s recognition of Jerusalem as Israel’s capital last December.